During an adjournment debate on the report of the committee appointed to look into the controversial Central Bank bond issuance, Opposition lawmaker Vasudeva Nanayakkara directed a torrent of abuse at Prime Minister Ranil Wickremesinghe. Speaker Chamal Rajapaksa warned Nanayakkara over his foul language, pointing out that there were schoolchildren present at the public gallery. “You know nothing about either a Standing Order or Point of Order. You are not willing to listen. How can you make me sit? You sit! The Speaker has given me permission to move the Point of Order. I respect the Parliament. I stood for my Point of Order. If I can’t stand for a Point of Order, what sort of a Parliament is this? What sort of a Prime Minister are you? You have mixed up your job,” an indignant Nanayakkara said while raising a Point of Order. “I promised that the consultative committee of my Ministry would be summoned to discuss the contents of this report. As far as this report is concerned the committee said there was no loss to the Treasury. This report has also criticised the shady transactions that took place from 2012-2015. It is there on the third page of this report. This report is not only about Arjuna Mahendran but also about the pervious Governor. Why not bring Ajith Nivard Cabraal to COPE to ask him how he approved borrowing without a tender committee? 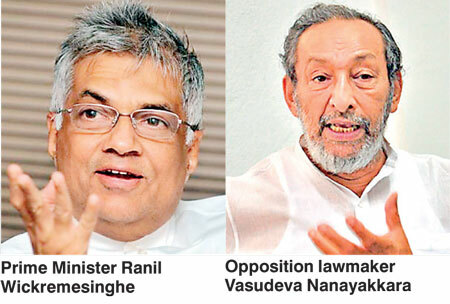 Are you protecting him?” Wickremesinghe asked. “The Parliament shouldn’t start allowing no-confidence motions against Government servants. It sets a bad example which will even lead to debates over no-confidence motions against Grama Sevakas,” he added. Central Bank has announced that it plans to sell US$ 100 million worth of development bonds to foreign and local investors. The Public Debt Department of Central Bank will issue US$ 100 million in Sri Lanka Development Bonds of 1 year 1 month and 2 years 11 months tenor. Minimum investment is US$ 100,000 with additional investments in multiples of US$ 10,000. The bonds are exempted from income tax paid in Sri Lanka. The issue will be open for subscription from May 22 to 28.